If you’re looking for a pure wooden floor then solid wood flooring is your answer. It gives you 100% solid timber and every plank is unique to give you the most natural looking floor. Available in a choice of brushed, oiled or simply lacquered finishes, straight cut planks or herringbone, tongue and groove or click systems and various widths and thicknesses. Browse our range of natural oak flooring and treat yourself to something special. 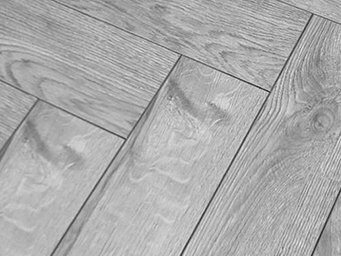 Solid wood flooring is a natural 100% wood product with each board coming from just one piece of solid wood which is cut down to the desired size, typically between 18 and 25 centimetres. The style of the cut of the wood can vary from flat-sawn, which is the most recognised style with a triangular grain, to quarter-sawn where the material is divided up into quarters, then rift-sawn, which gives a finish where the grain is horizontal. Type of wood All our wooden floors are made from a type of hardwood called Oak since these trees are available in the largest numbers compared to any other hardwood trees. Once cut into random length planks we protect the wood surface with either lacquer or oil after being brushed down to get to the fresher part of the wood. This ensures a longer lasting and better looking floor for years to come.